Here’s another 10-minute warmer tried and tested with my learners! This one is called ‘What mood are you in today?’ and can be used with all levels. Uber-busy teachers can download the lesson plan here. 1. Draw a graph onto the whiteboard with just a plain x/y axis (two lines). 2. Draw four categories on the x (horizontal) axis. You can choose any categories, mine were Sleep, Food, Busy at Work and Things to do. on the WB (above your graph). 4. Ask learners what the word ‘mood’ means? Elicit responses. You can say that a mood is a temporary feeling. When I lose my phone I am angry and in a bad mood. Am I angry forever? I’m in a good mood when students do their homework, when are you in a good mood? This can be done in pairs or open class. 6. Elicit responses. Correct if necessary. I want to find out what mood you are in today. But I need some information to help me. I want you to tell me about how much sleep you had last night, if you are hungry, if you are busy at work and if you have lots of things to do. 8. 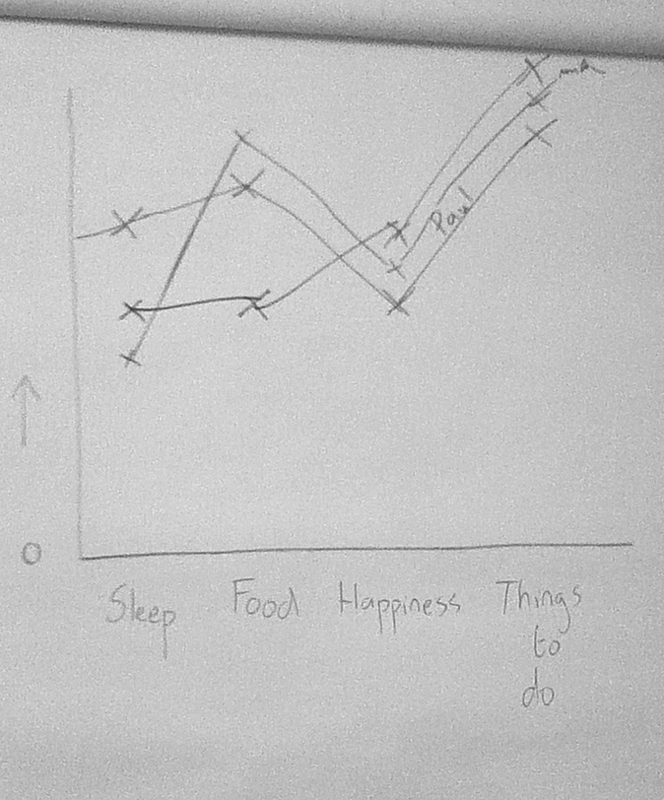 Plot your own points on the graph and then sign your ‘line’.Then either a) tell the learners about your sleep, hunger, busyness at work and things to do, or b) get them to ask you questions. 10. Repeat stages 8 and 9 until all your learners have plotted their information, and they have all asked each other questions about sleep, food, etc. Change the categories. For example, ‘time studying english’, ‘time travelling to work’, ‘time watching television’, ‘time listening to the teacher'(!) – and then put hours from zero to 6 on the y axis. 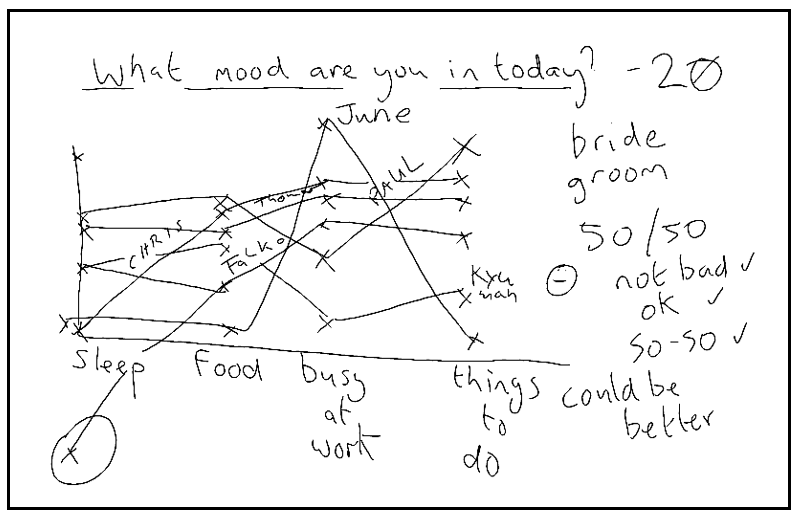 Below I changed the category ‘busy at work’ to ‘happiness’. This picture was taken from a B2/ C1 level group – this activity works with all levels! I’ve been experimenting with this warmer for a while now and it always works. But I’d really like to think of some categories that fit better – if you have any ideas, and if you use this lesson then feel free to comment. If you like the lesson plans and site please take 1 minute to answer this very short user experience survey. Also, if you want to receive automatic updates please enter your email address to follow the blog. This entry was posted on September 11, 2014 by paulwalsh in For Teachers, Warmers and tagged Action, activity, business english, busy teachers, Decentralised Learning, Decentralised Teaching, design, graph, Learner-Centred Curriculum, moods, warmer.